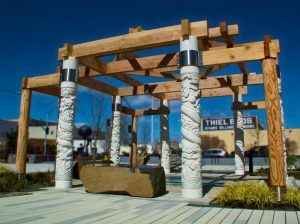 a short walk from Clementine’s Bed & Breakfast, you’ll find the “Garden of Surging Waves,” honoring two centuries of the Pacific Northwest’s ties to China and the many contributions Chinese immigrants to Astoria and the Lower Columbia River Basin. You see the evidence of their efforts from the railroads to the canneries to the jetties at the mouth of the Columbia River. The Garden, named for the Surging Waves Pavilion in a classical garden in Suzhou, China, expresses the themes of transition, values and Chinese design in its architecture and art. The garden’s juxtaposition of elements and contrasts of colors express the cultural transitions that Chinese immigrants experienced after arriving in Oregon. Quotes from Chinese philosophers and writers reflect their values of family, education, authenticity, and resourcefulness. The Garden integrates symbols from Chinese culture throughout its design. Local materials, such as the wood rails and elongated pavers resembling canneries’ wooden floor planks, reference the industries of timber, railroading, and fishing. Landscape design brings together traditional Chinese plants and trees with those native to this area. The Garden’s website provides detailed explanations about it symbolism, artwork, history, and stories of Chinese heritage, so don’t forget to view it as a part of your visit to the Garden. Astoria’s many attractions and activities will fill your busy days, but be sure to take some time as you walk through our historic district to pause and enjoy the Garden of Surging Waves’ tranquility and peace. The Garden changes with each season, so don’t wait to book your next getaway while spring is in the air! This entry was posted on Thursday, May 4th, 2017 at 1:35 pm and is filed under Attractions, Clementine's Bed & Breakfast News. You can follow any responses to this entry through the RSS 2.0 feed. Both comments and pings are currently closed.